Das ON-Market am Naschmarkt hat renoviert und ist seit 8.7.2016 wieder offen. Wir waren auch prompt am 8. zum Frühstück dort und es war sehr fein. Von den Fotos her wollte ich unbedingt mal hin, die Frühstück zusammenstellungen sahen sehr gut aus, aber die Reviews, die ich dazu fand waren eher"mäh", aber es war richtig fein, fand ich! Wir wollten unbedingt draußen im Schatten sitzen, was auch angenehm ist, nur muß man ein bissi abgehärtet sein, der größte Teil des Gastgartens ist direkt an der Wienzeile - da fühlt man sich an einem Freitag Morgen doch so richtig wie in einer Weltstadt (stichwort viele Autos auf der Wienzeile). Die Frühstückvarianten waren fein, von klassisch Wiener Frühstück bis zum Asiafrühstück mit Zia Bao und Reissuppe. Der Café war gut, und relativ schnell serviert genauso wie auch der Rest vom Frühstück und die Bedienung war sehr nett. Grad mal dass die Toiletten im Keller sind und ziemlich dunkel - vor allem an einem sonnigen Vormittag fand ich nicht so fein. Also, ich freu mich schon aufs nächste Frühstück im ON. ps. wir hatten reserviert, was um 10:30 an einem Freitag nicht notwendig war, kann aber auch daran liegen, dass sie gerade erst wieder aufgesperrt hatten. Heute keine echten Neuigkeiten, aber wenn das Wetter so schön ist will man doch wo draußen in Ruhe seinen Café schlürfen. Wie wärs also mit der Dachterrasse beim Dachboden vom 25hours Hotel? Das 25hours hotel in Wien hat 2011 aufgemacht, also nicht mehr ganz neu, aber immer noch gut! Natürlich muss ich gestehen, dass ich als Wienerin noch nicht dort abgestiegen bin (es war bisjetzt noch kein Bedarf vorhanden) aber im Restaurant im Garten und am Dachboden war ich schon öfters. und gerade bei so herrlichem Sommerwetter, ist ein Besuch oben auf der terrasse schwer zu empfehlen. Die Aussicht ist herrlich. Für den großen Hunger würde ich aber unten im Garten oder im Restaurant bleiben. Also, ein wunderbares Sommerwochenende noch! Diesen Blogpost gibt es auch auf Deutsch. Nearly two months ago i found the Bullet journal system. I have been researching different organizational systems lately and have been looking for tips and tricks to increase efficiency or to optimize Task list. The bullet journal system seems to me to be a good system to incorporate many of these tips and tricks. Since I have several friends interested in that system I thought I should finally compile a reference list for the tips and tricks that helped me most. Unfortunately I have not found a lot of information in German, most of it was in English. However I decided to write this blog post both in English and German. I originally found the idea of the bullet journal via Pinterest, the Coffee table book of the “all-knowing, all-seeing Trash Heap” internet (the fraggles, anybody?!?) 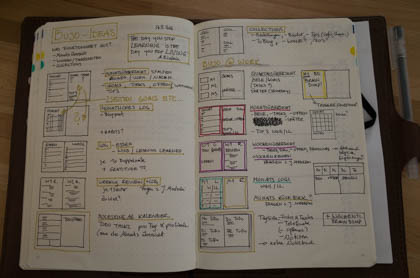 and via Pinterest stumbled upon several well made blogs and communities about the bullet journal system. Despite this long list, i would definitely start with the homepage of the original Bullet journal, the system developed by Ryder Caroll, since he developed/ dreamed up the system and all. After watching the video and reading through the first infos on that page I was slightly confused, and overwhelmed. To be honest, I wasn’t really sure how to use that system. There were so many options and decisions to make. So I just let it simmer for a while, slept on it, kept reading more blogs and info and started small. 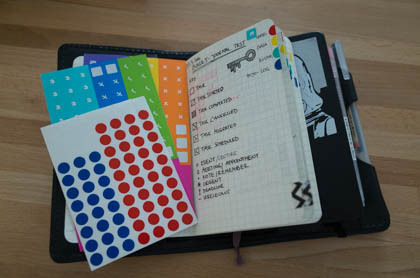 For years I have been using a Moleskine diary (the pocket size 12 month weekly notebook) and just began changing my task lists in that diary into the BuJo style task lists. Also I used an extra notebook, also pocket sized to try a weekly BuJo layout that very first week. The pocket notebook was great to test some of the BuJo ideas; the weekly spreads, collections and lists, and decide what to keep and what to develop further. Especially the idea of the collections drew me in. there are examples in the net of people having collections of movies to watch or watched, their meal planning for the next week or when to clean what etc. this seems to be a bit much for my lifestyle, but why not. After just a short time I had to accept the fact, that the pocket sized notebook is just too small for me, page wise. And I switched up to a “big” A5 notebook (dot grid…), which seems to be a favorite for many BuJo Fans, and for a reason (or many). The key to the BuJo system in my opinion is the duality of a diary with appointments and tasks and the idea of a log. To make it more precise, the duality of planning and reality, a comparison that fascinates me. I think that that is something that cannot be easily achieved with digital tools, but is sort of built into the analog system, especially using pen and paper and not erasing old outdated info. It starts to be a kind of historical record (albeit a very short and recent history). give it a try for a couple of weeks, try out different layouts, weekly or dayly, tryout different ideas using it as a personal log, try out some collections and lists. there are so many people out there fascinated with this system, hence there seem to be a million tips and hacks to try, find them via the blog on bulletjournal.com or pinterest or via some blogs or even youtube. Some of the example pages online are extremely intricate and artistic, very impressive and not what could work for me in my daily life, but still full of ideas that could be used in some way or other in my own journal, maybe a detail or a way of recordkeeping or that funny font etc. I am estimating that I will do something similar in another 4 or 6 weeks, and will be able to compare how the adjustments held up to daily use. 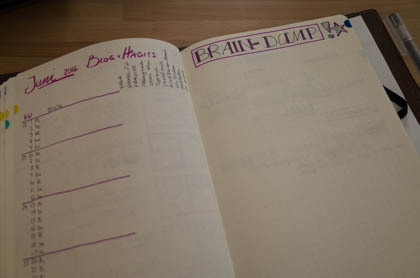 I am also planning to use some aspects of the BuJo system for my work, I especially love the idea of the Brain dump, and I see a lot of promise for that one in a line of work where new info’s and request can come in at any time throughout the day. This is all fine for my work, but working in a team with colleagues has slightly different demands which will never be realized in today’s world with an analogue system in my opinion, hence I see the great advantages in the BuJo system for me as a work log and brainstorming and note organizing tool, for cooperation at work I still am a fan of the classic Outlook diary or tasklist tools such as Wunderlist, although we switched to Asana some months back and that has become an extremely valuable tool for me at work. First time I see a realistic chance to schedule my doctors appointments or vacations better. Kickstarter is my downfall, especially because I tend to forget what I supported and when they promised delivery, but not anymore! No matter how the layout is exactly, as long as I have the big picture of monthly goals and task as well as waiting on (information or deliveries promised to me that might need reminding) it offers a big advantage for me. I love it. Great idea, of course there are apps (habit rpg fun but not really traceable) for tracking habits or new years resolutions etc. but with this in my BuJo I actually can look back and see how I have been doing so far. Writing down three things I am grateful for is an idea I have been stumbling upon for some time now, and I think it’s a great idea, and especially suited to be included in my BuJo. Cheers, hugs and have fun with your BuJo! This Blogpost is also available in english. Vor fast zwei Monaten habe ich das System Bullettjournal entdeckt. Ich habe mich in letzter Zeit mehr mit verschiedenen Organisationssystemen beschäftigt und tips und Tricks zur Effizienzsteigerung oder zu „ToDo-Lsiten“ gesucht und auch gefunden. Das Bullettjournal scheint mir eine gute Methode zu sein viele dieser Aspekte zu vereinen. Und weil inzwischen auch einige meiner FreundInnen daran interessiert sind schreibe ich hier mal eine Referenzliste zusammen, wo man den gute Tips und Tricks finden kann. Leider gibt es vor allem Referenzen auf englisch, ich habe fast keine auf Deutsch gefunden und ehrlich gesagt auch irgendwann aufgehört zu suchen. Weshalb es diesen Blogpost auch auf Englisch gibt. Ich bin über Pinterest, das Fotoalbum der allwissenden Müllhalde Internet (Fraggles?!?!) auf die Idee des Bullettjournals gestoßen und darüber auch auf verschiedene großartige Blogs und communities zum Thema Bullettjournal. 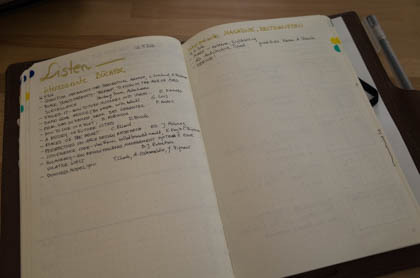 Beginnen würde ich auch auf jeden fall mit der Originalseite auf Bullet Journal von Ryder Carroll, der das System ja auch entwickelt/erfunden hat. Nach dem Video und der ersten Information auf der Webseite schwirrte mir gehörig der Kopf. Und ehrlich gesagt, wusste ich noch nicht so richtig, wie ich das System jetzt wirklich verwenden kann/soll. Weshalb ich es einmal ein bisschen setzen ließ, darüber geschlafen hab, weitere Blogs gelesen und ganz klein begonnen habe. Ich verwende seit Jahren einen kleinen Moleskine Kalender (den 12 Monate Wochen Notizkalender Pocketsize) und habe damit begonnen einfach meine übliche ToDo-Liste in diesen Kalender zu übernehmen. Die allererste Woche habe ich aber BuJo style in einem extra Notizbuch (auch Pocketsize) begonnen. Das war angenehm, weil ich hier in einem kleinen Notizbuch austesten konnte, welche Konzepte des BuJo Systems ich mag, welche ich weiterentwickeln möchte etc. Gerade die Idee von Listen (Collections) ist für mich ein Fass ohne Boden! Es gibt Leute, die machen Collections von Filme, die Sie sehen wollen, gesehen haben, oder von ihrem Speiseplan für die nächste Woche oder wann Sie was Putzen wollen/ geputzt haben etc. Dies scheint mir teilweise etwas zu viel – zumindest für mein Leben. Nach kurzer Zeit mit meinem Pocketnotizbuch musste ich feststellen, dass mir der Platz ausging. Nämlich der pro Seite, und deshalb bin auch ich jetzt – wie anscheinend die meisten BuJo fans – bei einem A5 Notizbuch. Der Schlüssel zum BuJo liegt meiner Meinung nach in der Dualität von Kalender und Terminplaner und der Idee eines Logbuches. Das heißt die Dualität von Planung und Wirklichkeit, mich reizt dieser direkte Vergleich, den ich in einem digitalen System in ganz anderer Weise realisieren kann als im analogen System des BuJo Notizbuchs. Allein die Tatsache, dass alles mit Stift auf Papier festgehalten wird ist eine Art von „Geschichtsschreibung“, weil ich auch nichts „löschen“ oder ausradieren würde. es gibt einige wirklich gute tricks, vor allem auch über den Blog direkt vom Bullet Journal oder eben über Pinterest oder die anderen Blogs oder Listen anschauen. Einige der Seiten online sind extrem liebevoll und zeitintensiv ausgestaltet, das ist zuviel für mich, trotzdem ist es einfach schön diese Bilder anzusehen, und vielleicht gibt es ja ein Detail oder eine Schriftart, die ich auch einmal ausprobieren möchte. nach ein paar Wochen (bei mir waren es ca. 6Wochen mit BuJo) habe ich mir eine Übersicht gemacht von den Seiten und Informationen, die ich in meinem privaten BuJo(und meinen Arbeitsnotizbuch) aufnehmen möchte. Ich erwarte für mich, dass ich etwas ähnliches in weiteren 4 oder 6 Wochen machen werde und dann wieder vergleichen kann, hat es so funktioniert wie ich mir das damals dachte. Ich möchte Aspekte des BuJos auch in der Arbeit verwenden, gerade die Idee des „BrainDumps“ liebe ich und ist glaube ich grandios gerade für eine Arbeit mit vielen verschiedenen Anfragen quer über den Tag verteilt. Für die Zusammenarbeit mit Kollegen im Büro ist ein analoges BuJo natürlich nur mäßig sinnvoll. Hier sehe ich den Vorteil des BuJos als mein Arbeits- und Brainstorming-werkzeug und zur Zusammenarbeit verwenden wir verschiedene digitale Werkzeuge, angefangen vom klassischen Outlook Kalender bis hin zu Tasklisten Programmen (Wunderlist ist fein, Asana seit einigen Monaten mein absoluter Favorit). Kickstarte ist mein Untergang, vor allem weil ich oft vergesse, was ich wann unterstützt habe und wann die Lieferung versprochen worden ist. Das habe ich mit dieser Liste ein bisschen besser im Griff! Egal wie das Layout genau aussieht, wichtig für mich ist der Überblick über das gesamte Monat, Ziele/ Goals und Tasks/Zu erledigende Punkte genauso wie Offenes, also Informationen oder Lieferungen, auf die ich warte und die ich eventuell urgieren oder nachfragen muss. Was für eine Idee! Habits, also Gewohnheiten, oder Vorsätze sind so übersichtlich nachzuvollziehen, natürlich gibt es auch dafür Apps (Habit rpg – lustig, aber nicht nachvollziehbar) aber die analoge Variante im BuJo finde ich sehr befriedigend, auch wenn ich bei weitem nicht erfolgreich beim erfüllen aller Punkte bin. Eine Idee, die ich schon öfters gesehen habe ist es jeden Tag 3 Punkte aufzuschreiben, für die man dankbar ist. Und so etwas ist perfekt im Tageslog meines BuJos aufgehoben. Also, busserl und baba und viel Spaß mit Euren BuJo’s!